Leader of Jumhoory Party (JP) Qasim Ibrahim will understand the right path one day, says Minister of Economic Development, Mohamed Saeed. Speaking at ruling Progressive Party of Maldives (PPM)’s “Mi Jeeluge Adu” rally in Hulhumale’ last Saturday night, Saeed said Qasim was someone he had deep respect for, but that Qasim was also the person behind the recent attempt to overthrow incumbent President Abdulla Yameen Abdul Gayoom’s administration. Saeed – who worked as a manager at Qasim’s Sun Island Resort - said he was confident Qasim will recognize the right path one day. “They attempted the coup with Qasim Ibrahim backing it. President Maumoon, even after his 30-year presidency, is one pillar of the coup. And then there’s Nasheed. He lacks any wisdom, any love,” said Saeed. Meanwhile, Qasim, during an interview to RaajjeTV on Saturday, swore he offered no one any bribe money. He pleaded no involvement in any bribery, and said the allegation was an attempt to frame the opposition. Qasim, who currently resides in Germany, also pled his son, Siyad Qasim’s innocence. 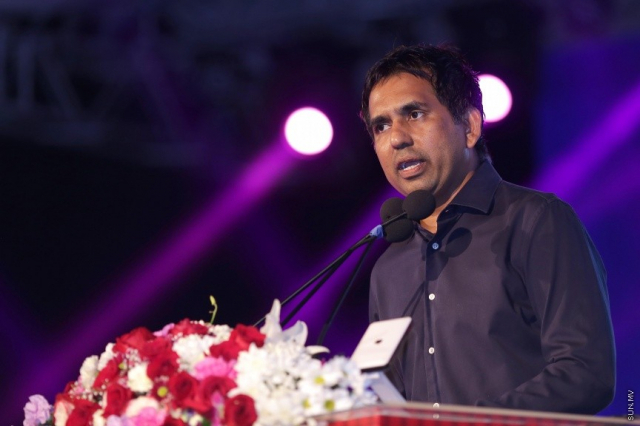 Qasim said that Siyad, who is currently under police custody on charges of suspected involvement in the coup attempt, would never do anything like offering bribes. Qasim said no one in his family had any involvement in bribery. Saeed, during his speech at PPM’s rally on Saturday night, was extremely critical of former President Maumoon Abdul Gayoom and former President Mohamed Nasheed. He said that Nasheed, or a member of his family had a hand in every coup which has taken place in Maldives. And criticized the current alliance between the Nasheed and Maumoon, who had once been political rivals. “Where are our rights? The rights of the people? Where are the rights of the people during the 30 years and the three-and-a-half years? They sold the entire country. Can there be any two more merciless?” questioned Saeed during his speech.